Glenavon were totally outclassed on Tuesday night as league leaders Crusaders thrashed them 6 – 1 at Mourneview Park. The Lurgan Blues took the lead on 17 minutes when Mark Sykes scored a fine goal, but Crusaders came back to lead 2 – 1 at the break through a Jordan Owens goal and a Gavin Whyte penalty. Owens and Whyte each struck again inside the opening five minutes of the second half to put the Crues 4 – 1 up and take the game away from Glenavon. Paul Heatley got the fifth goal in the 73rd minute, before Owens completed his hat-trick on 89 minutes to seal a resounding 6 – 1 win for the visitors. 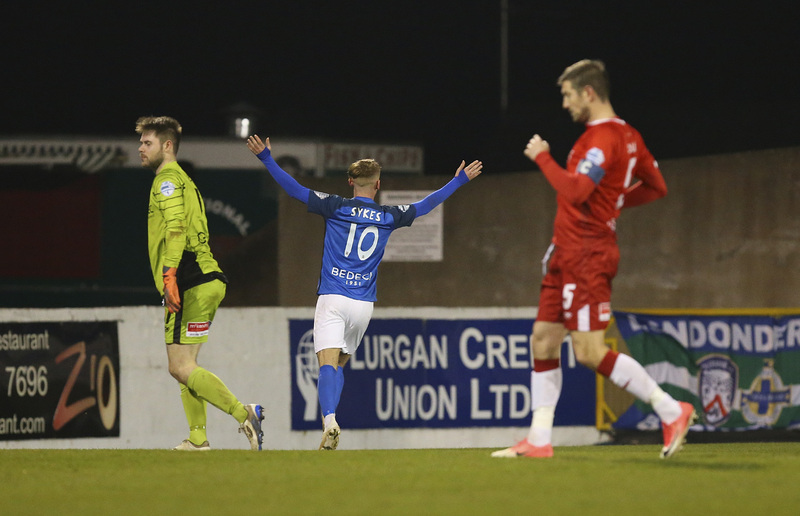 It was clear from the first few minutes of the match that it was going to be an open, attack-minded game of football, but it also looked at that stage that Glenavon were going to have a much bigger say on the outcome of the match. They had a half-hearted penalty appeal turned down inside the opening two minutes when Billy Joe Burns challenged namesake Bobby, then Josh Daniels was presented with a great opportunity to open the scoring when Stephen Murray picked him out with a cross moments later, but the winger couldn’t steer his effort past the hulking figure of Brian Jensen in the Crusaders goal. In between those incidents Heatley had a decent chance for Crusaders after Jonathan Tuffey failed to hold Forsythe’s cross while under pressure from Owens. Rhys Marshall did well to block Heatley’s effort. Marshall did even better to deny Owens in the eighth minute when he got back to make a perfectly timed last-ditch tackle just as the big striker was about to put away the rebound from a Heatley effort that Tuffey had saved following a mix-up between Sammy Clingan and Andrew Doyle. Clingan made another uncharacteristic error on 12 minutes when his sliced clearance sent Heatley clear. This time it took a combination of Marshall and Tuffey to deny the Crusaders man. But it was Glenavon who broke the deadlock in the 18th minute. Daniels stepped inside left-back Sean Ward before feeding the ball to Sykes on the edge of the penalty area. The midfielder brilliantly jinked past Crusaders captain Colin Coates, then struck a low shot with his right foot which beat Jensen. Crusaders drew level less than 10 minutes later. Ironically, after his excellent start to the game, it was a terrible error from Marshall which led to the equaliser. His attempted back-pass was badly under-hit, and Owens gratefully gobbled up the chance that was gifted to him, rounding Tuffey and slotting the ball into an empty net. Glenavon very nearly had an opportunity to restore their lead on 31 minutes when Andrew Mitchell played a ball over the top for Murray to run onto, but Howard Beverland did well to get back and snuff out the danger just as it looked like the striker was going to get clean through on goal. 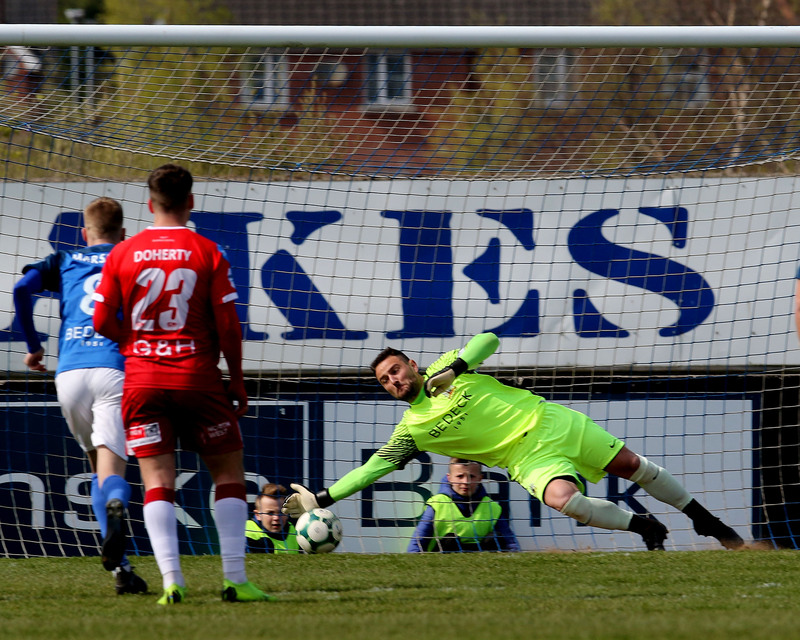 Whyte had been having a quiet first half by his own very high standards, but he sprung into life a couple of minutes later, first with an effort from distance which Tuffey saved comfortably enough, then with a rasping strike that the Glenavon keeper had to tip over the bar. On 38 minutes Whyte got his name on the scoresheet from the penalty spot. Referee Raymond Crangle awarded the spot-kick for a handball by Doyle, adjudging him to have deliberately blocked Philip Lowry’s goalbound effort with his arm. Whyte calmly sent Tuffey the wrong way to give the Crues a 2 – 1 lead. Crusaders raced out of the blocks at the start of the second half, effectively ending the game as a contest inside the first five minutes of the second period with a quick-fire double. First Owens grabbed his second of the game on 47 minutes with a trademark header from Whyte’s cross, then the winger completed his brace two minutes later with a goal of real class, a shot with his right foot from 25 yards which swerved away from the diving Tuffey and inside the far post. 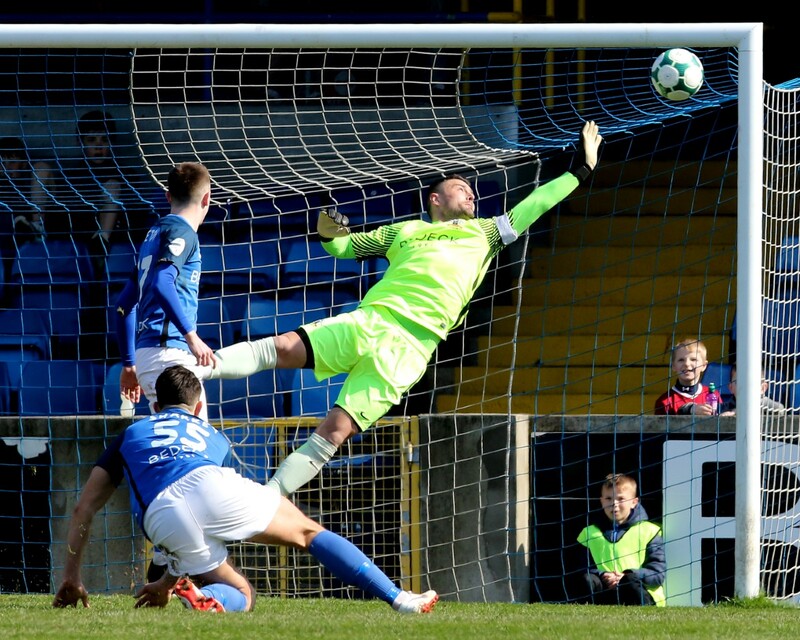 As Glenavon committed bodies forward in an effort to try and claw their way back into the game they were always going to be vulnerable against the clinical Crues. Heatley got in on the act in the 73rd minute. Burns surged forward, carrying the ball past Doyle, before slipping it through for Heatley, who deftly lifted the ball over the onrushing Tuffey to make it 5 – 1 to the visitors. Burns was again the provider as Owens completed his hat-trick a minute before the end. 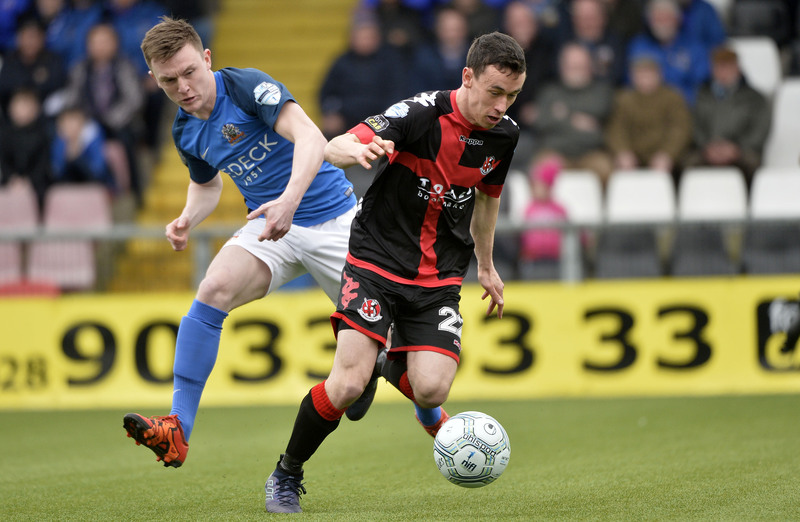 The full-back’s low cross from the right picked out Owens on the edge of the penalty area and he slammed his first-time shot into the top corner to seal an emphatic 6 – 1 win for Crusaders which sends them five points clear of second-placed Coleraine. 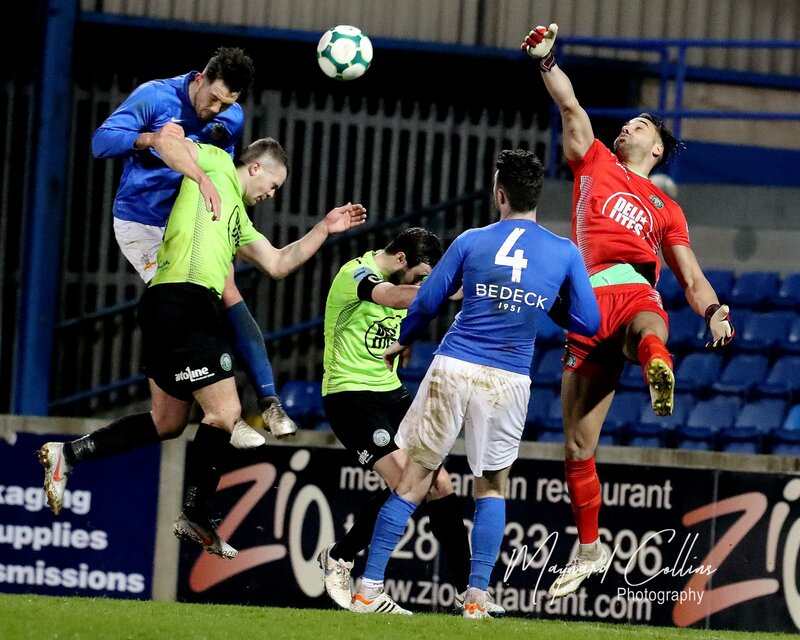 Glenavon are not in a position to lick their wounds following two very disappointing defeats, with Glentoran due to visit Mourneview Park on Saturday (March 10th). The Lurgan Blues know that they will have to drastically raise the level of their performance for that match if they are to get anything against a Glens side that has been resurgent under Ronnie McFall in recent weeks.